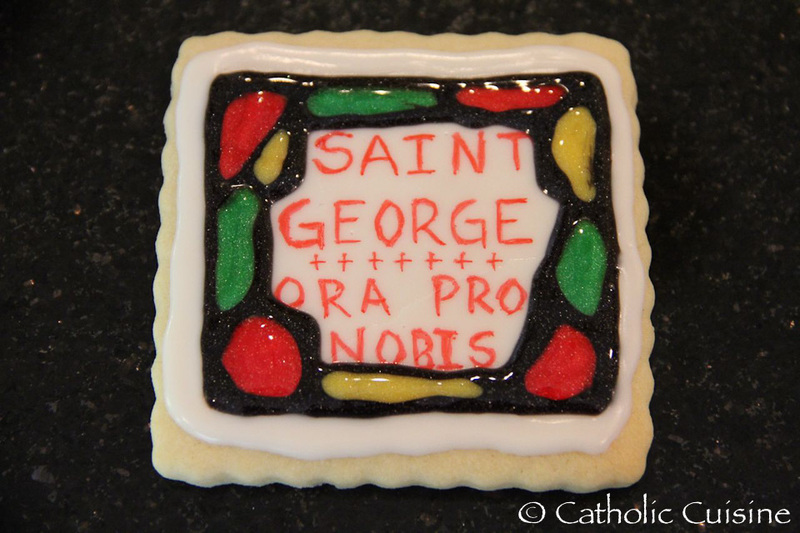 The following recipe adapted from Cooking with the Saints was submitted by Hi Cookery in honor of the feast of St. Joseph the Worker. Thank you Highlander and Islander! Highlander used to toil in construction to pay his way through college. The wages were low and the labor was hard but he knew what he had to do to make a living. 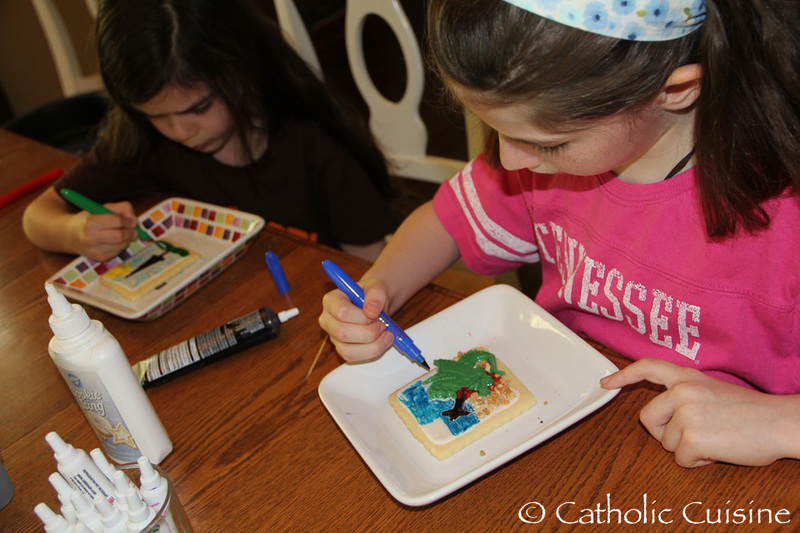 St. Joseph the Worker is an inspiration to those like Highlander who work(ed) in blue-collar professions to provide for the future and their families. Jesus’ earthly stepfather is deservedly fêted twice a year on March 19 and again on May 1. 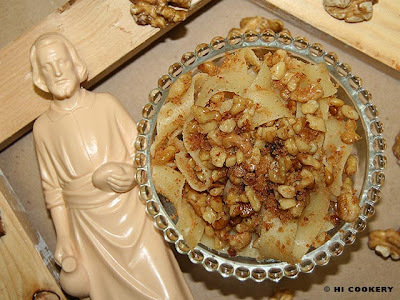 We honor him with a sweet pasta dish called Pappardelle di San Giuseppe (Noodles for St. Joseph’s Day), which is traditionally eaten in the Italian region of Lucania. 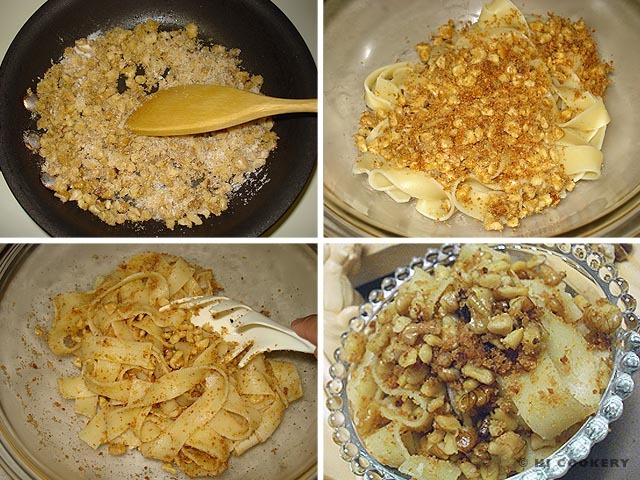 The sprinkling of the noodles’ topping ingredients symbolizes the holy carpenter’s sawdust. Cook the pasta in boiling salted water as directed on the package. Drain and set aside. In a large skillet, heat the olive oil on medium high. Stir-fry the walnuts, breadcrumbs and sugar. 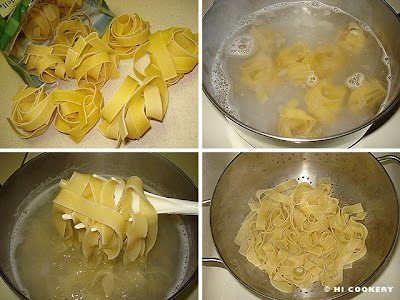 Remove from heat and mix with the drained pasta. 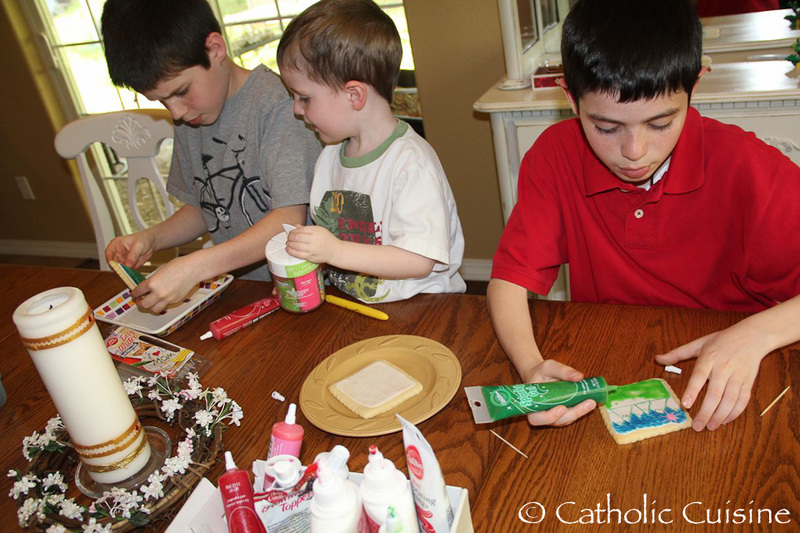 They're so easy, kids of all ages could even assemble themselves! 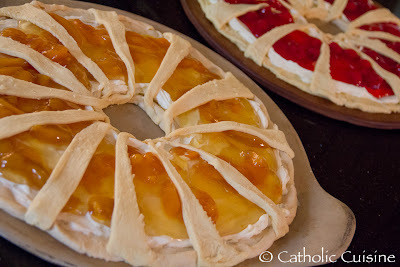 We made individual fruit plates but one large plate would be sweet too. For one individual plate, I used approximately 2 cutie oranges. In addition, making 4 plates used 2 kiwi, 1 apple and 1 banana. We made these cute and simple sandwiches for last year's "Heavenly Zoo Garden Party" inspired by Charlotte. I'm planning on making them again today in honor of the feast of St. Mark, since he is symbolized by a winged lion. Our sandwiches were just turkey and cheese, surrounded by shredded carrot. Add a couple chocolate chips for the eyes and pipe on frosting for the mouth. 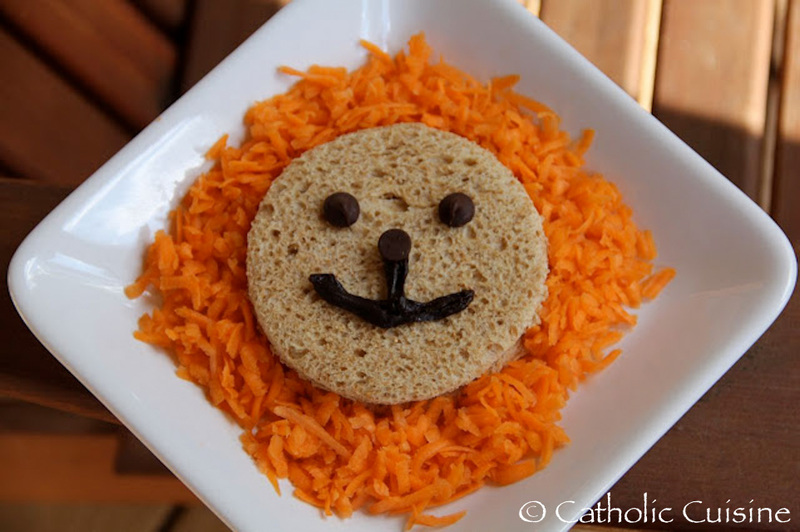 I may also serve some Lion and Cheese Crackers, which I came up with for our 2011 Heavenly Zoo Garden Party. This little guy was inspired by a Bear Cheese and Crackers Snack, to which I made a couple tiny modifications. 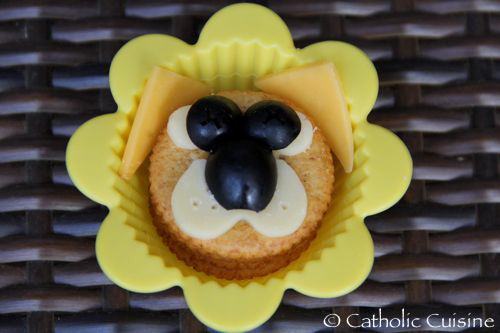 Our Flower Silicone Cups worked great for his mane and the kids loved the cheese, crackers and olives. 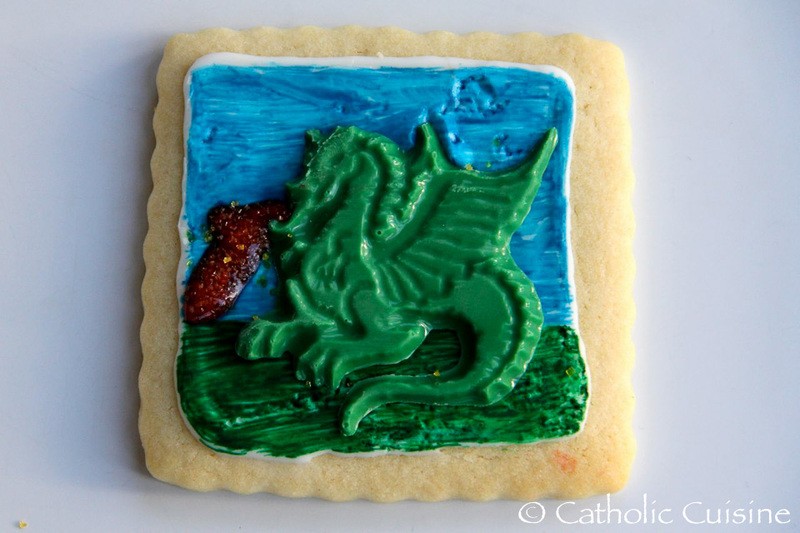 You can find other ideas for the feast of St. Mark in the archives. 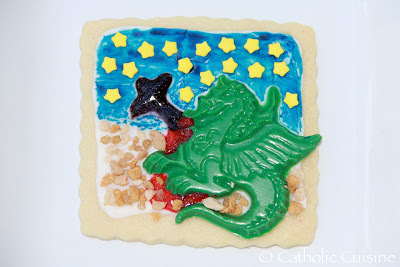 With a cold front blowing in dropping our temps by 20-30 degrees, I did not want to head to the store with the baby to get supplies to make one of our traditional Dragon Cakes, so I decided to see what we had in the pantry. 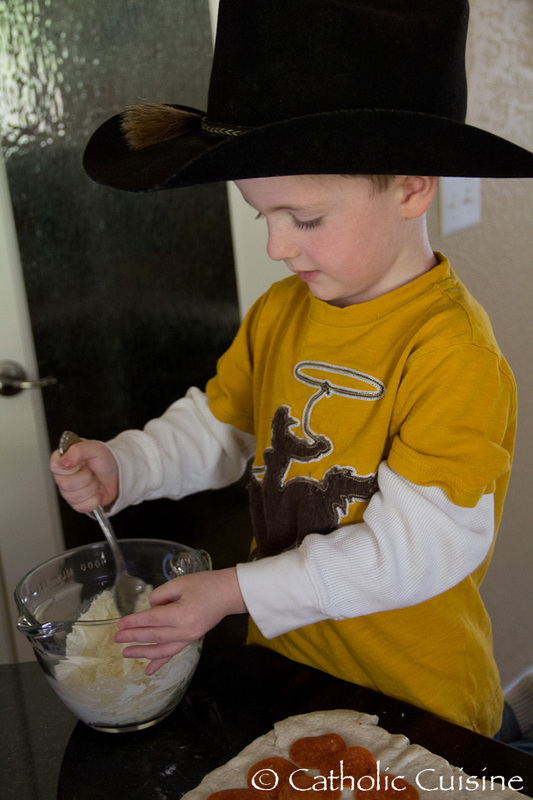 We had a gluten free chocolate cake mix, candy melts and the makings of this frosting which tasted good but could have used more powdered sugar to set up better. This is what it looked like before decorating. The layout is pretty simple. I cut one cupcake in half to use for the eyes. Melted candy melts piped from a ziploc bag make the spikes and claws. Happy Feast of St. George, the dragon slayer! 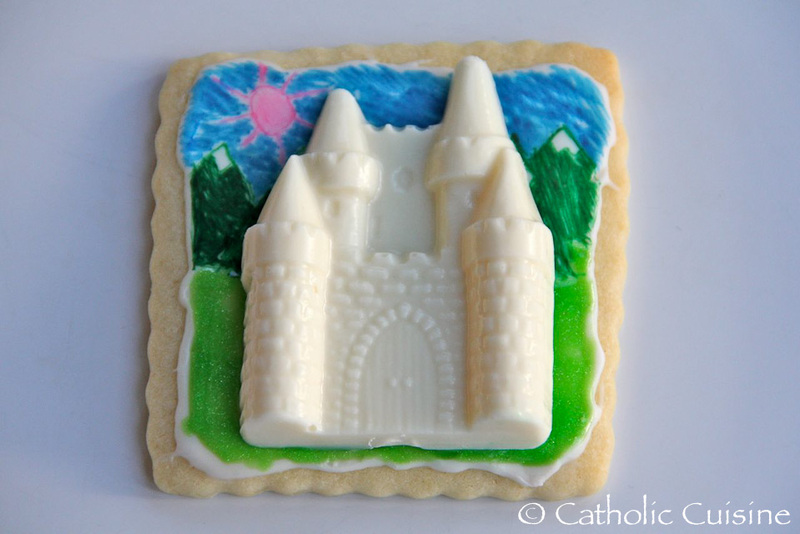 I just realized that I never shared our Sugar Cookie Story Quilt, inspired by our much loved picture book, here at Catholic Cuisine! 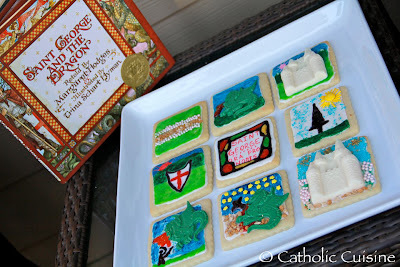 Our children had so much fun creating this last year on the feast of St. George. You can find my original post over at Shower of Roses. "In the Days when monsters and giants and fairy folk lived in England, a noble knight was riding across a plain... The Red Cross Knight had never yet faced a foe, and did not even know his name or where he had been born. But now he was bound on a great adventure, sent by the Queen of the Fairies to try his young strength against a deadly enemy, a dragon grim and horrible." "He was laying waste to her land so that many frightened people had left their homes and run away. Others had shut themselves inside the walls of a castle with Una's father and mother, the king and queen of the country. " "Now we have come to my own country," said Una. "Be on your guard. See, there is the city and the great brass tower that my parents built strong enough to stand against the brassy-scaled dragon." "He wore heavy armor and carried an ancient silver shield marked with a red cross. It was dented with the blows of many battles fought long ago by other brave knights." "He called your George, which means 'Plow of the Earth' and 'Fight the Good Fight.' 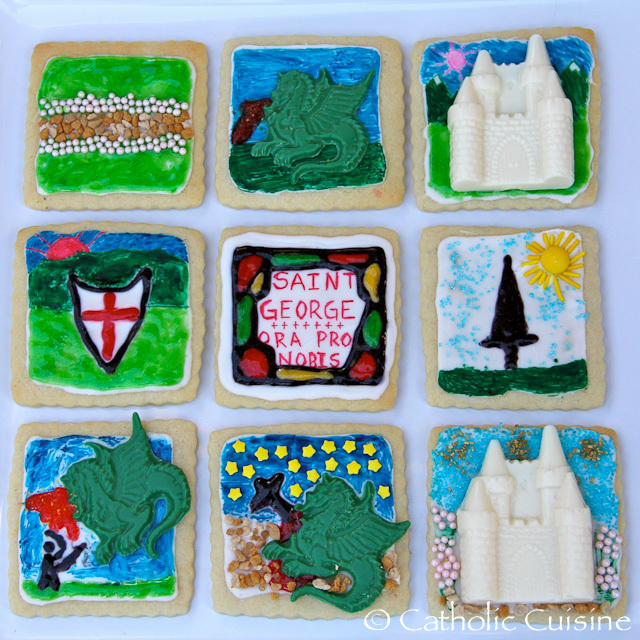 For you were born to be England's friend and patron saint, Saint George of Merry England." "And the knight's bright weapon, taking advantage of that open jaw, ran it through with such strength that the dragon fell dead, breathing his last in smoke and cloud." "Then they heard a hideous roaring that filled the air with terror and seemed to shake the ground. The dreadful dragon lay stretched on the sunny side of a great hill, like a great hill himself, and when he saw the knight's armor glistening in the sunlight, he came eagerly to do battle." "Like a mountain he fell, and lay still. The knight himself trembled to see that fall, and his dear lady did not dare to come near to thank her faithful knight until she saw that the dragon would stir no more." "Trumpets sounded the news that the great beast had fallen... And Una and the Red Cross Knight were married and lived together joyfully." This past weekend we celebrated my daughter's 8th birthday! 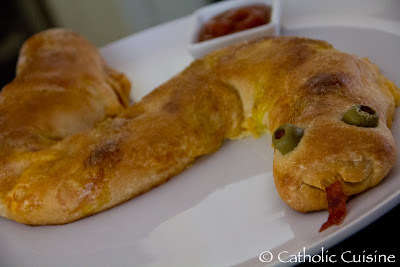 One of the recipes I made was a Snake-Bite Calzone, at the suggestion of Charlotte's daughter! (Thank you Shortcake!) I thought I'd post the recipe here, since I'm planning on making another snake dragon calzone (maybe adding a few spikes, wings and feet) for my children to eat slay on today's feast of St. George! 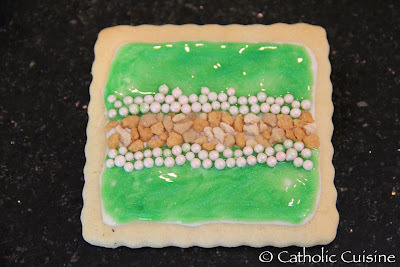 It would also be perfect for the feast of St. Patrick. Heat oven to 350°F. Unroll the pizza dough on lightly floured work surface; roll or flatten to 17x10-inch rectangle. 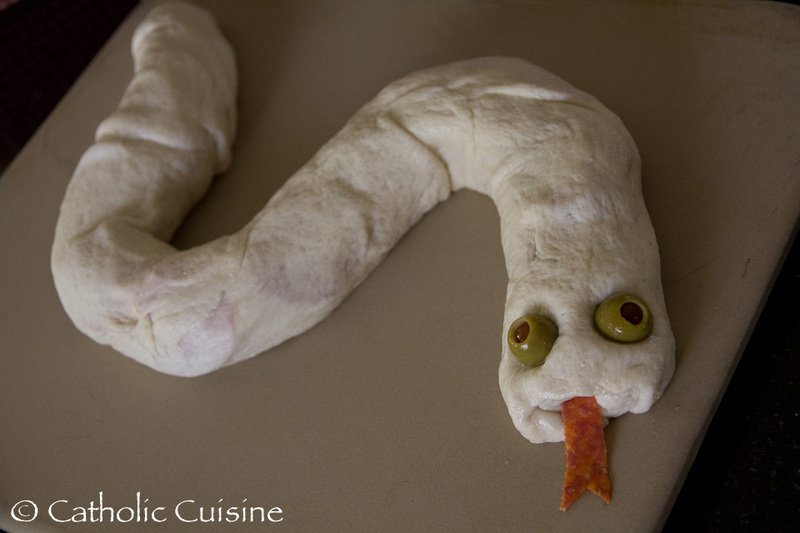 Cut 1 pepperoni slice to resemble a snake's tongue; set aside. 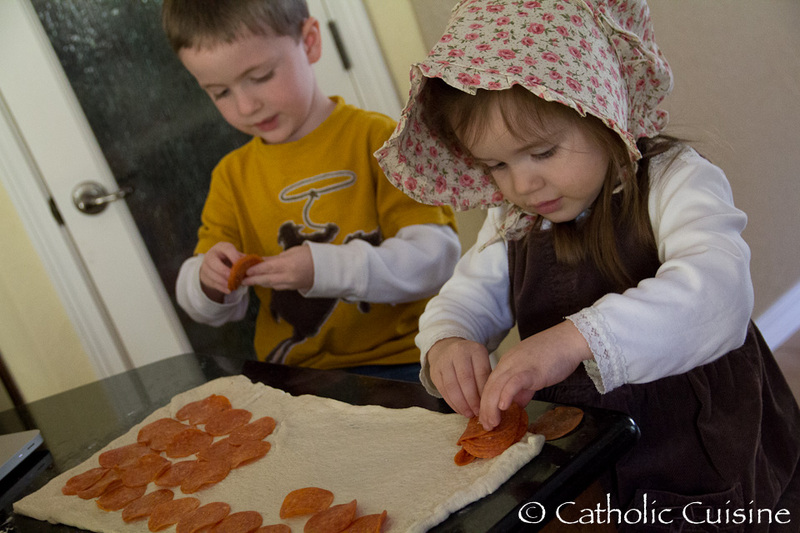 Arrange remaining pepperoni slices over dough rectangle, leaving a 1-inch border around all sides. Combine cheeses. 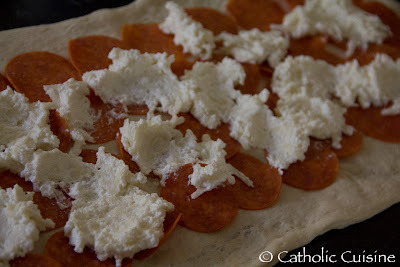 Top pepperoni with spoonfuls of the cheese mixture. 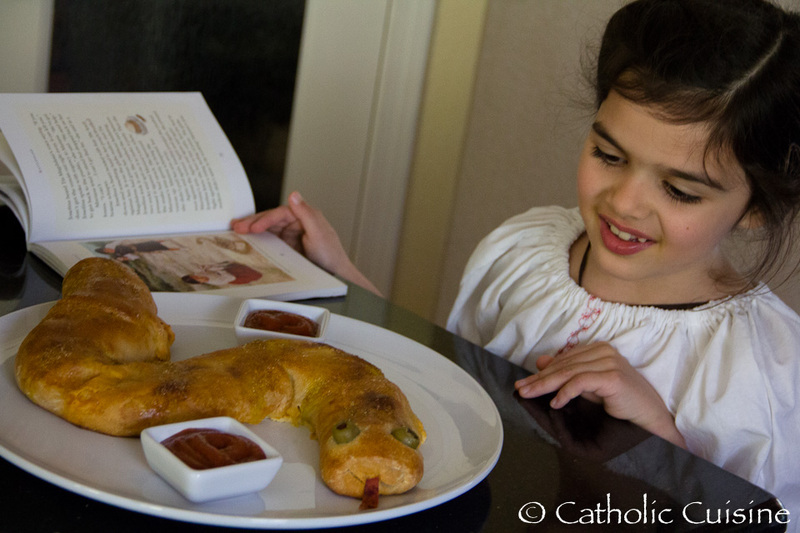 Roll up dough, jelly-roll fashion, starting at one long side; pinch seams together to seal. Place, seam-side down, in "s" shape on baking sheet sprayed with cooking spray to resemble snake. 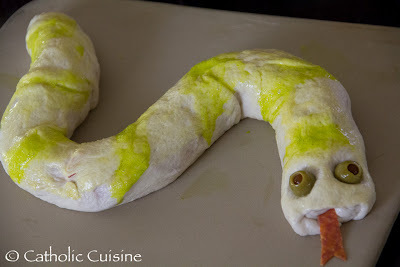 Insert olives into one end of dough for the snake's eyes. Add pepperoni tongue. 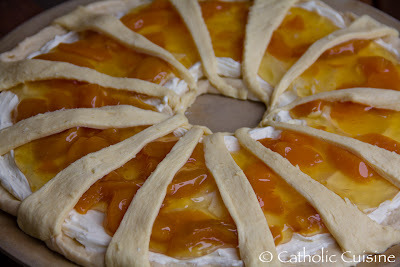 Beat egg white and yellow food coloring lightly with fork; brush about half over dough. Add green food coloring to remaining egg white; brush randomly over dough to resemble a snake's splotched skin. Bake 30 to 35 min. or until golden brown. Meanwhile, heat pizza sauce just until warmed. Serve the calzone with the pizza sauce. Today is the traditional feast of St. Bernadette Soubirous, saint of Lourdes and Pope Emeritus Benedict XVI's 86th birthday! 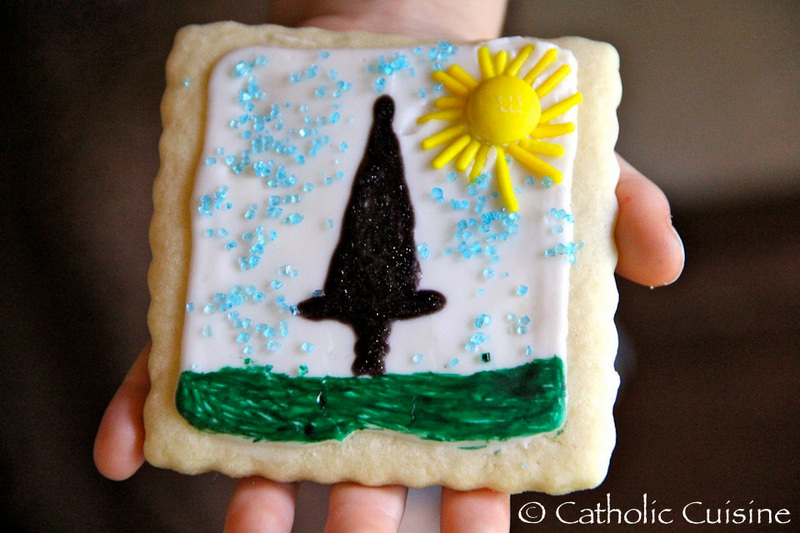 I thought it would be the perfect time to share the beautiful gluten-free treat submitted by Summer, which she made for her children earlier this year on the feast of Our Lady of Lourdes and the day on which Pope Benedict announced his resignation. Thank you Summer! I woke up Monday morning [February 11, 2013] to the news that Pope Benedict had resigned from the papacy. After I cried, remembered to pray, and gathered up my little ones to tell them the news, I had to ready everyone for a party. As it was the feast day of Our Lady of Lourdes and I needed a gluten free treat to help keep my kids away from the other tasty pastries, I made the grotto. This time, however, I used popcorn because that is what was in the cupboard. 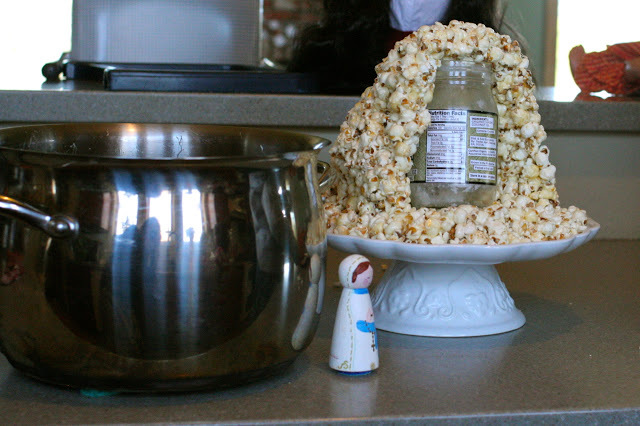 Elizabeth Foss inspired me with her popcorn snowballs. 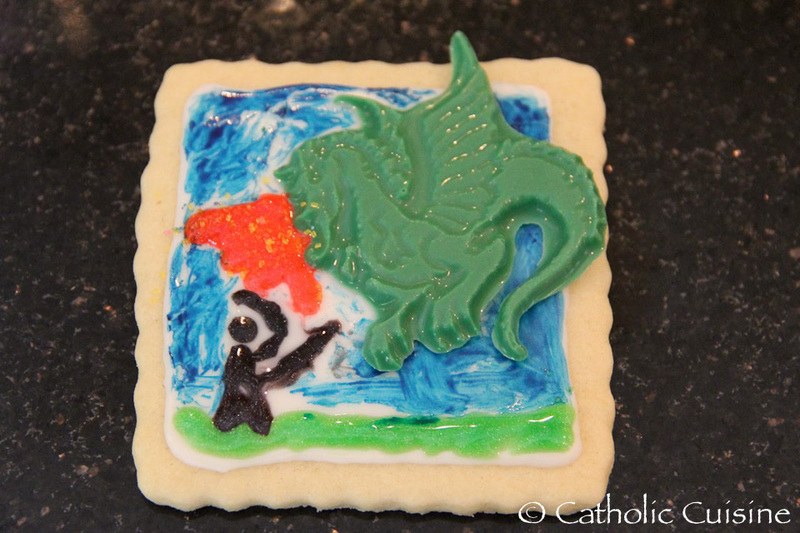 Let me tell you, big and little ones demolished this treat. The three-year-olds just stood around taking little bits like Hansel and Gretal. 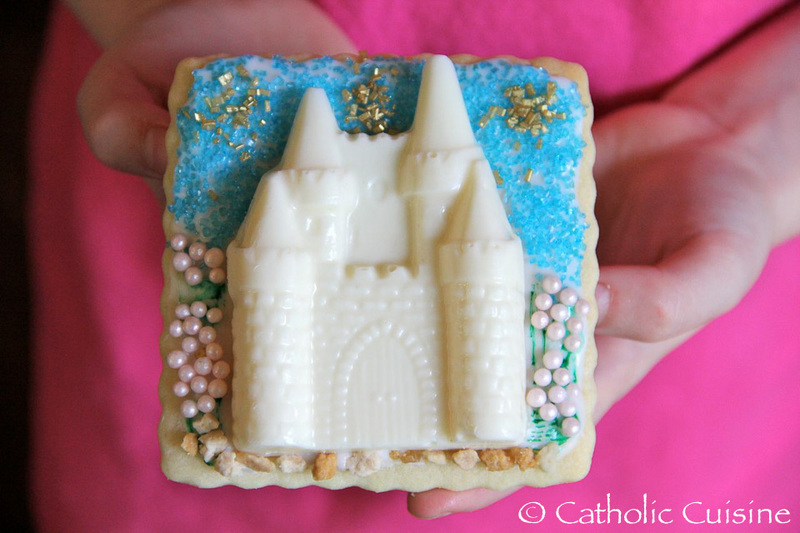 It's truly delicious and easier to mold than rice crispies! We will definitely make this version in the future. I pop the corn on the stove in the pot. If you let the pot heat first, without the oil, there will be far less smoking and time spent shaking the thing. Also, coconut oil can take much higher temperatures and is delicious. Throw a couple of corn kernels in to see if they pop right away, if so, toss the rest in, put the lid on, and shake until the popping sounds slow way down. Transfer to another bowl. In the same pot (I don't like to do dishes) melt the butter, toss in the salt, then melt the marshmallows. You know how to do this, right? Stir all that popcorn back in until it is well coated. Using well greased hands, mold warm yummy goodness into your grotto. Really press everything together. Try not to eat too much during this step! I used a jar to prop up the roof until it cooled. 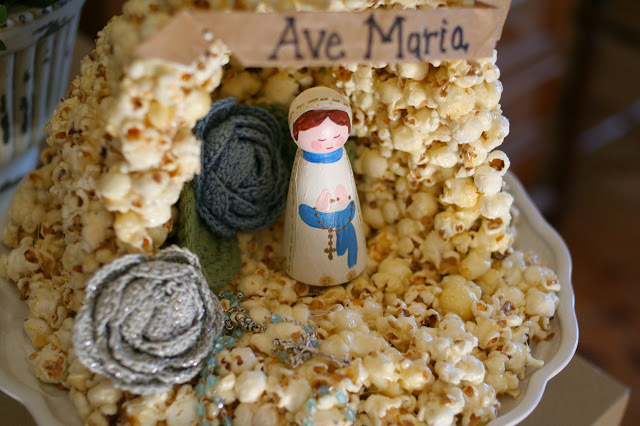 Add a little statue of Mary and a decoration or two. Easy! 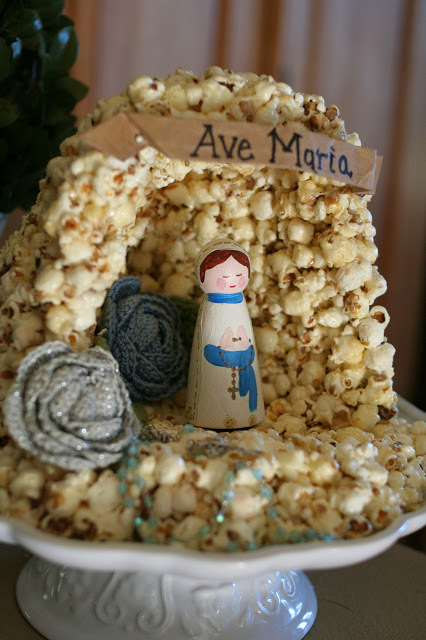 You can find grottos made from Cocoa Pebbles, Fruity Pebbles, and Rice Krispy Treats in addition to other ideas for Our Lady of Lourdes and St. Bernadette in the archives. 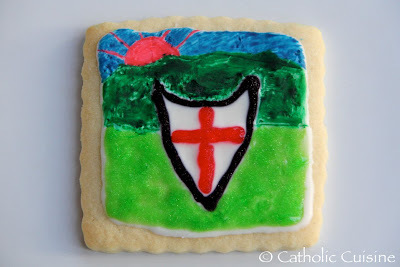 This afternoon, following the completion of our Divine Mercy Novena, my children enjoyed decorating cookies. 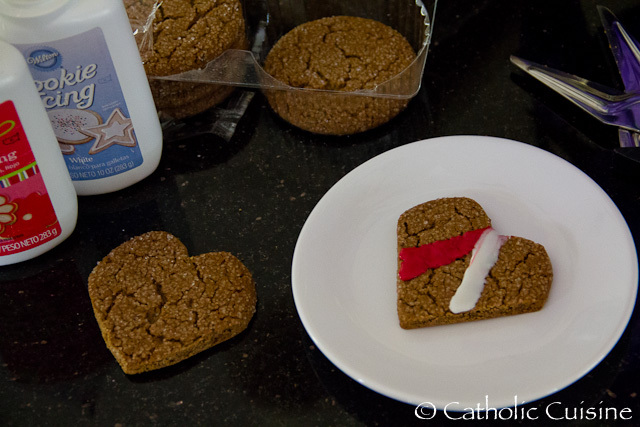 We just used some soft molasses cookies I had in the cupboard, trimming them into the shape of a heart with kitchen scissors, though any heart shaped cookie would work. 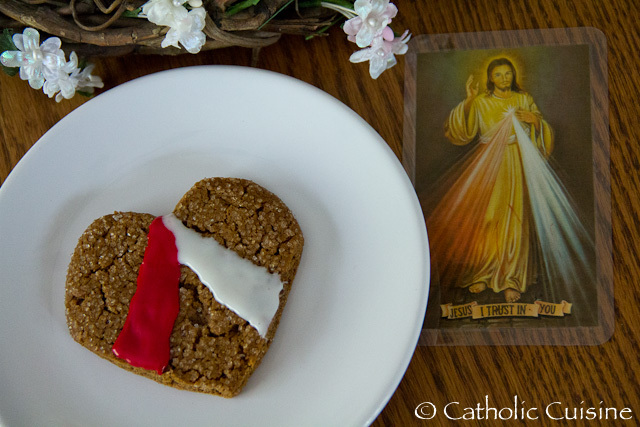 Then we simply added red and white cookie icing to represent the rays of blood and water that flowed from Jesus' pierced heart. 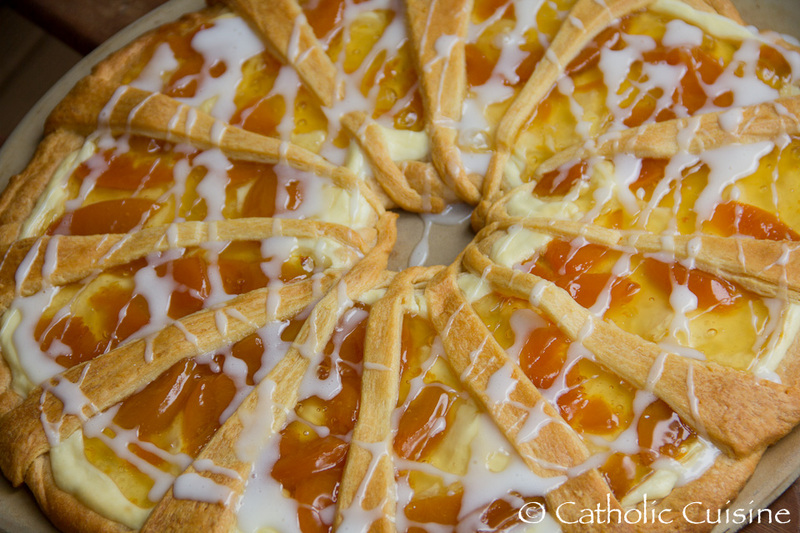 Back in 2008 I shared the recipe for our favorite Cherry Cheese Coffee Cake. 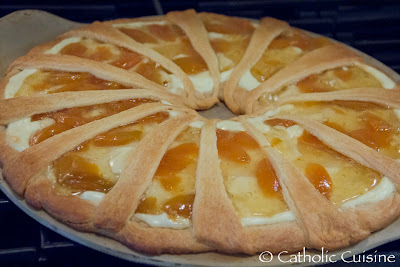 It is always one of the first things requested, especially by my husband, every holiday! This year my aunt asked me to include it in our Easter Menu and so I decided to try a variation as well, incorporating the liturgical Easter colors of "white" and "gold!" The cherry is still my personal favorite, but the peach was also very good! Unroll crescent dough and arrange 12 of the triangles in a circle with wide ends toward the outside edge of the Large Round Stone or Baking Sheet - the points will not meet in the center. Lightly flour and roll out the seams making a 14" circle with a 3" hole in the center. Note: I use my Pampered Chef Large Round Stone, though any 16" stone or pizza pan will work. You may need to reduce the bake time by a couple minutes if you are using a metal pan instead of the stone. Cut each of the 4 remaining triangles into thirds (starting at the wide end opposite the point and cutting lengthwise to the point). 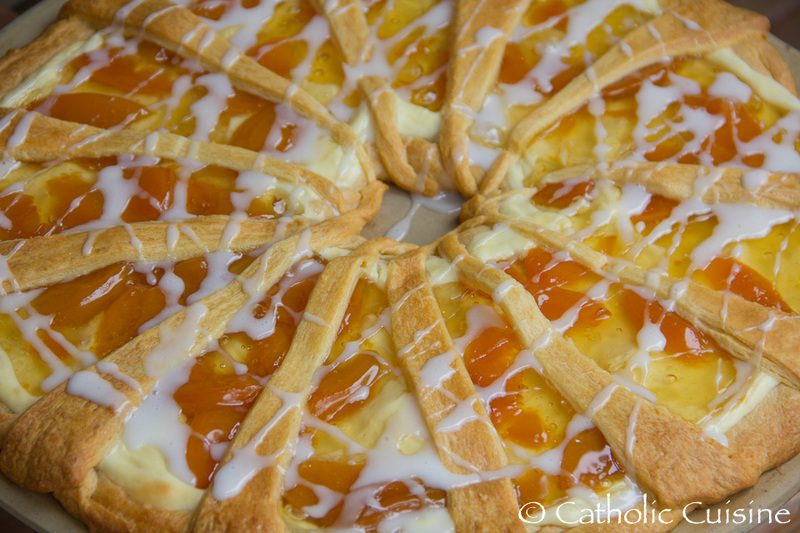 Arrange over filling evenly in spoke-like pattern. Press ends to seal at center and outer edges. Bake 25-30 minutes or until golden brown. Cool slightly. It is a little late for this Easter, but I wanted to share this with you anyway. It would be a great dessert for many feast days, including Valentine's Day or Pentecost. Add some blueberries and it would be a fun dessert for Divine Mercy Sunday as well! In our family we have people with gluten intolerance and one poor little muffin who is lactose intolerant. So I generally have to get a bit creative with our holiday treats. All I could think about was the fact that I wanted to have that wonderful trifle here at Catholic Cuisine we have every year on Easter. So I searched the net, but nothing looked very good (well to me, that is, I was being picky). Then I found, on Pinterest, a link on how to make whip cream from canned coconut milk. 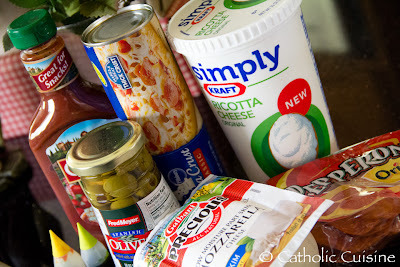 With that and a gluten free cake mix from Pamela's I knew I had it! Bake the cake according to directions. Do this the night before and let it cool completely. I had to hide mine on top of the fridge. In the morning cut up into 1 inch cubes. Poor the almond or coconut milk over the cubed cake till it is moist but not soaked. 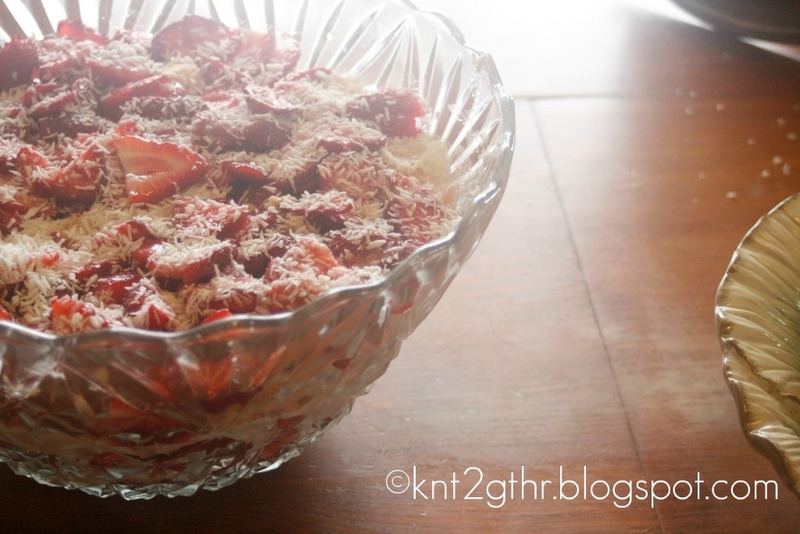 Cut the strawberries and sprinkle with coconut and sweetener, mix. Make the coconut whipped cream. Follow these directions. They work and it is AMAZING. I didn't have enough whipped cream for the top because one of my cans got shook up, which was a huge disappointment. So we only had one layer of the coconut whipped cream instead of two. I ended up drizzling the other can a little over everyone's servings instead. 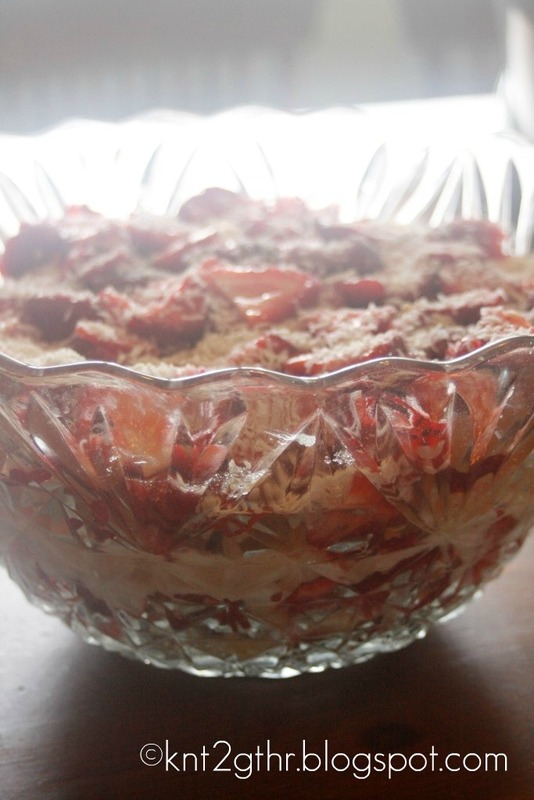 On the bottom of your trifle or glass bowl, put half the cake. Put half the strawberry mixture on top of that, then half of the 2 cans worth of whipped coconut cream. Repeat. On top place a decorative strawberry and some toasted coconut.